R: Disciple of the Old Ways gains first strike until end of turn. 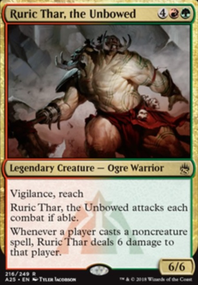 Out: Skinbrand Goblin, Bloodscale Prowler, Burning-Tree Shaman, Gristleback, Ghor-Clan Bloodscale, Scab-Clan Charger, Scorchwalker, Gruul Scrapper, Ghor-Clan Savage, Streetbreaker Wurm, Disciple of the Old Ways, Forest. In: Hellraiser Goblin, Indrik Stomphowler, Lobber Crew, Maze Rusher, Molten Primordial, Silhana Starfletcher, Sylvan Primordial, Wild Beastmaster, Wurmweaver Coil, Five-Alarm Fire, Breath of Fury, Aerial Predation. A common mistake of new players is they have good intentions but expand and try to have a single deck do way to much stuff. A deck should do at least two things very good. For example, tokens and +1/+1 counters. Your deck looks like you just took a bunch of cards you thought had some cool mechanics and threw it all together. That's not going to work. Trust me. My very first deck was an 84 card five color slurry of my best things. I had 22 lands and never won a single game with it. I now have decks that rip apart mill decks, destroy Planeswalker decks, bypass defenses, and find other ways to win. But each one of those things I listed is a wholly separate deck design. Build for a strategy in mind to win and focus around that. Akroma's Memorial is the perfect example. It's a beautiful card that really tips the tide in your favor. However, you need to ramp to get it out, and you need to have some way of protecting it from removal, such as through Darksteel Forge. Now that's where your Sideboard comes into play. Not every deck will have "Destroy artifact" or "Exile target nonland permanent." (An example is Utter End). When your opponent has removal, you use your Sideboard to respond. Think of your Sideboard like a contingency plan. Don't flood it with spells that are awesome but you wanted to trim down. No, it's your Swiss Army Knife; You have it in case you need it, not because you think all the blades look cool. But your deck doesn't build up to or protect Akroma's Memorial, so it won't really help you at all here. I noticed you have a card in there that is 100% useless for you: Disciple of the Old Ways. You don't produce red mana, so you can't even activate her ability. Karametra, God of Harvests is one of my favorite Gods. 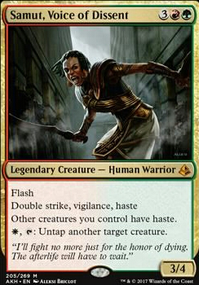 Included with her is Iroas, God of Victory and Mogis, God of Slaughter. Again though, you need to build them into the deck. You can't just throw it into any old deck and expect it to work. For example, I have a Boros (Red-White) Ally deck. To be fair it's approximately 2/3rds Ally and the remaining 1/3rd uses creatures and methods to pump everything else up. Iroas works there because I can throw everything into perma-Menace, making it much harder to stop my militia from assaulting. 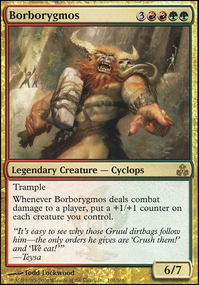 Mogis is used in my Rakdos (Red-Black) land destruction / sacrifice deck. I use Demons such as Archfiend of Depravity to force you to remove creatures while I cast spells like Rain of Tears to destroy your lands. Charmbreaker Devils to reuse spells and Typhoid Rats for T1 defense. Decks like these benefit highly from Gods because the deck is designed to abuse the God's ability. In Karametra's case, your deck isn't fast enough nor potent enough to warrant her ability of any use. She works best in a Landfall deck. If you're looking to get lands quick and cheap, turn your attention to things such as Khalni Heart Expedition or Map the Wastes. 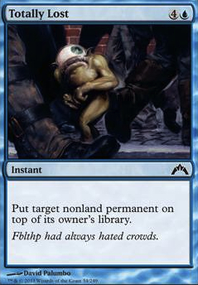 Lastly, find probably 7 or 8 cards that work really, really well together and have 3 - 4 of them in your deck. You need synergy. That is to say, you need each spell in your deck to build off of each other spell. A combo deck is when one thing triggers or activates another, which in turn does something else, which does another thing... Synergy is when everything pulls together into one big nasty picture of f***-all. And watch your converted mana cost. You're all over the place. Your deck should ideally look like a bellcurve that's leaning toward the left. 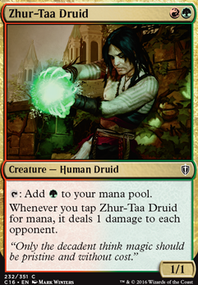 That is to say, the bulk of your cards should be around 1-3 cost and tapering down toward the 7-cost. Ramp decks break this rule because you can have super high costs really easily. Hell, I have an Eldrazi deck where half of my spells cost 7 or more. I get by this with lands like Eldrazi Temple, Temple of the False God, and Shrine of the Forsaken Gods. TL;DR - Focus on lower costs, more synergy, and one or two mechanics at most.